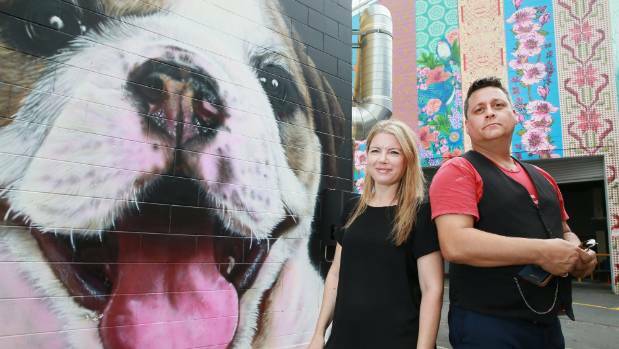 Boon Hamilton Street Art Festival organisers Charlotte Isaac and Phillip Guthrie are looking forward to this year’s event, which will transform walls around the central city and in Frankton from Thursday, March 8 until Sunday, March 11. Hamilton has a reputation for blandness, but it is a reputation that is slowly being colourfully obliterated, one wall at a time. The pace will increase to several walls at one time from Thursday until Sunday, when the third Boon Hamilton Street Art Festival is held. 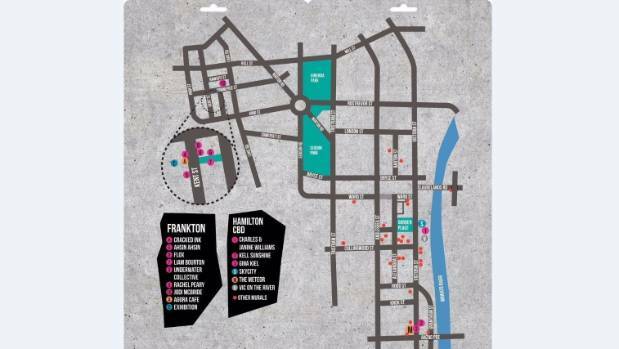 Walls in Frankton and Hamilton’s central business district will get a new look after this coming weekend. The now-annual was founded by artist Paul Bradley – aka Paul Be – and Hamilton arts’ advocate,Charlotte Isaac, both of whom wanted to see more art around their city. And Hamilton certainly had plenty of blank walls to enliven. That first festival, in November 2015, featured 11 artists tackling 10 walls. The pace has remained roughly the same at each festival since then. Janine Williams and Charles Williams have been working together as artists for about three years. This year seven walls in Frankton’s business precinct and three in the central city will be receiving the Boon treatment. The largest surface – 39 metres wide and 15m high – overlooks the new Victoria on the River park and will be Hamilton’s largest ever artwork. 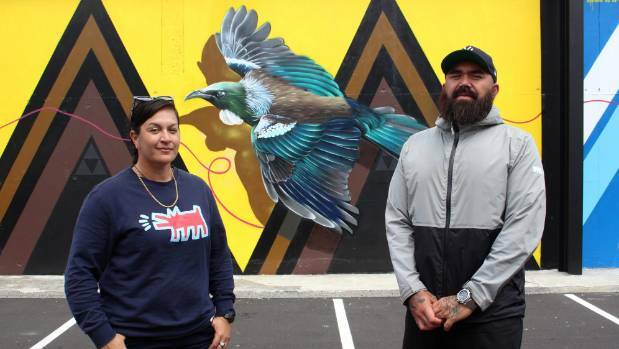 Visitors to the park will be able to watch the wall as it is painted by the internationally-renowned, Auckland-based duo Charles and Janine Williams. “It’s a massive canvas. Absolutely huge. It’s already being prepped,” organiser Phillip Guthrie said. Gina Kiel, another of the street artists contributing to the Boon Hamilton Street Art Festival. “There are so many good artists participating this year. there is going to be a high concentration of talent in the one place – it’s fantastic.”Hamilton-based artists at this year’s festival include Ahsin Ahsin, Jodi McBride, the Underwater Collective’s Ali Selliman, Rachel Peary, and Liam Bourton.Other visiting mural magicians include the mighty Flox (aka Hayley King), Cracked Ink (aka Simon Ormerod), Kell Sunshine, and Gina Kiel. 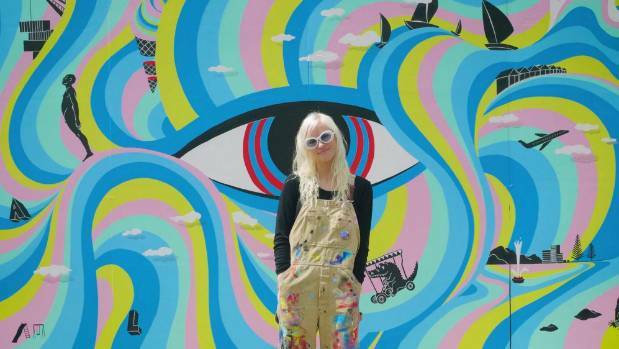 Street artist Kell Sunshine, seen here with a mural she painted on the wall of the Eruption Brewery in Lyttelton, will transform a wall on Victoria St.
For the first time the festival will feature an exhibition, at Agora Cafe in Frankton, where past and present artists can exhibit and sell their work. This will be held at Agora Café in Frankton. Several businesses are supporting the festival in various ways. First Credit Union help fund it, Resene Paints supplies paint, and Total Access leases scissor lifts and scaffolds to get the artists to where they need to go. As with previous years, an enthusiastic team of street art-lovers will be volunteering their assistance to the core organising team. Rickshaws will be operating to take people from mural to mural. 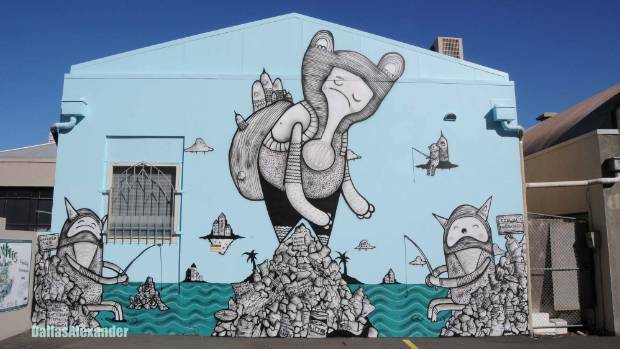 This Christchurch mural on the topic of over-fishing is by the New Zealand artist known as Cracked Ink, who is also taking part in the Boon Hamilton Street Art Festival. Isaac said a street art scene had long been missing from the city, but this was now changing. 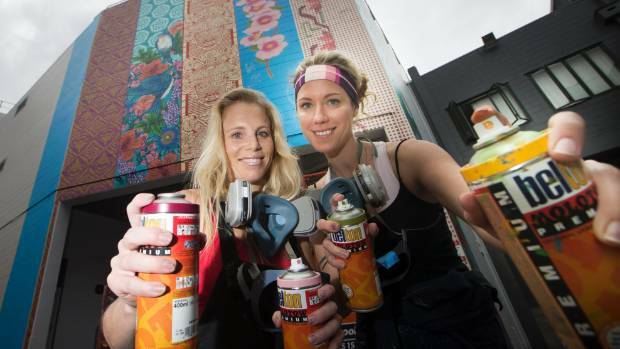 Artist Hayley King, aka Flox, left, and her assistant Linda Watson created the large mural along the Central Library laneway off Alexandra Street. 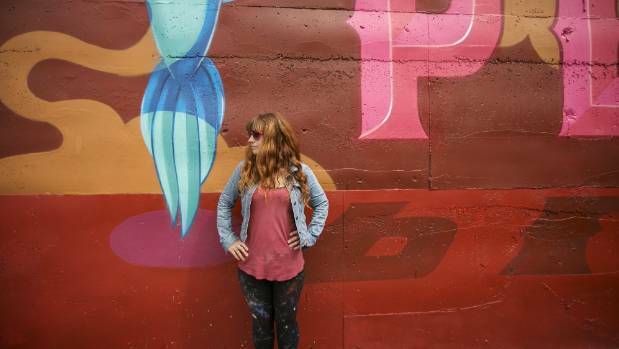 Some landowners and tennants still mistakenly believed that street art attracted unsavory elements, but it was the reverse that was true, she said. “There’s no doubt that it improves a place in all sorts of ways. We are negotiating with more business owners to get more art up, and we have our eyes on a lot of the blank walls around the city.